Exciting news in the Canadian market a few days ago. Google announced they would offer Canadian small businesses (SMBs) a free website and .CA domain name via a program called Canada Get Your Business Online. 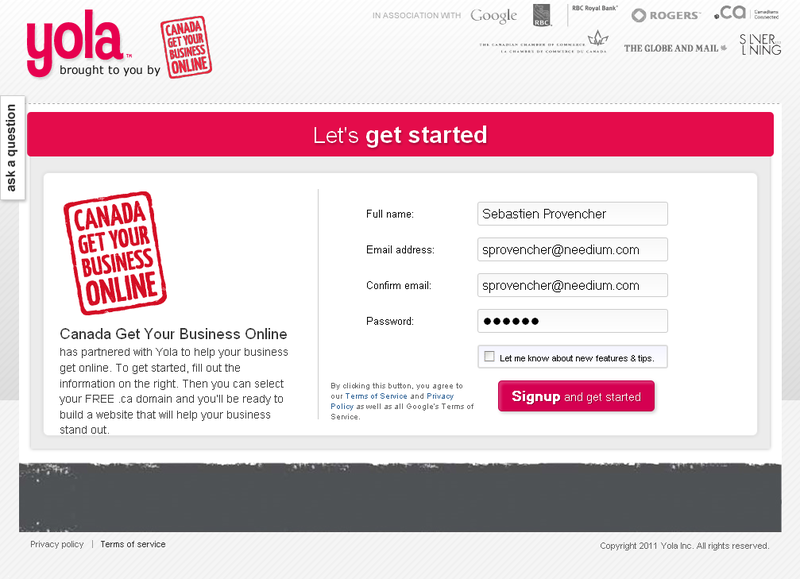 To help Canadian small businesses overcome the obstacles that are preventing them from getting online and fuelling Canada’s digital economy, Google is launching a new program called Canada Get Your Business Online that will provide free websites with a .ca domain, and free advice for businesses across Canada. (…) Google estimates that at least 1.2 million Canadian small businesses don’t have websites. 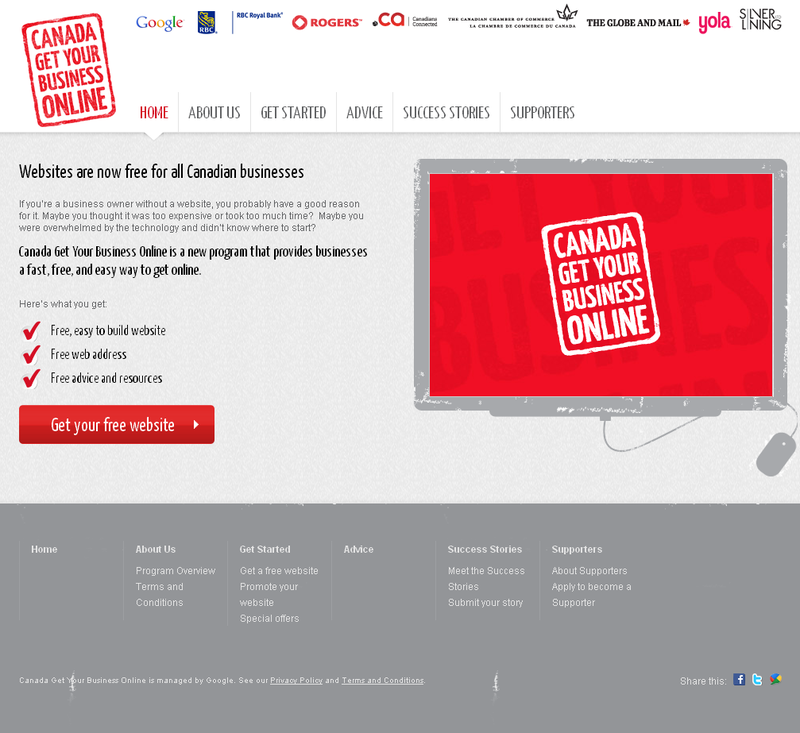 (…) To learn more about the Canada Get Your Business Online program visit www.gybo.ca. Google understands that if small merchants don’t have a website, they can’t really buy AdWords, Google’s core pay-for-performance advertising model. I thought to myself, what a great idea! An entry website is a commodity. By bundling it with a domain name and offering everything for free, you lock-in the small business advertiser and you are able to upsell them AdWords and Google Tags. For this purpose, they partnered with Yola, a free website-building technology provider. In productizing Needium, I’ve been exploring entry-level website solutions in the last few weeks. We’ve found that SMBs who have a website perform better in social media. The site serves as the permanent anchor, where all your business information resides and where consumers coming from social media can read more about you and evaluate if you’re “real” or not. It is with great hope I started creating a test Website on www.gybo.ca but I quickly became disenchanted. 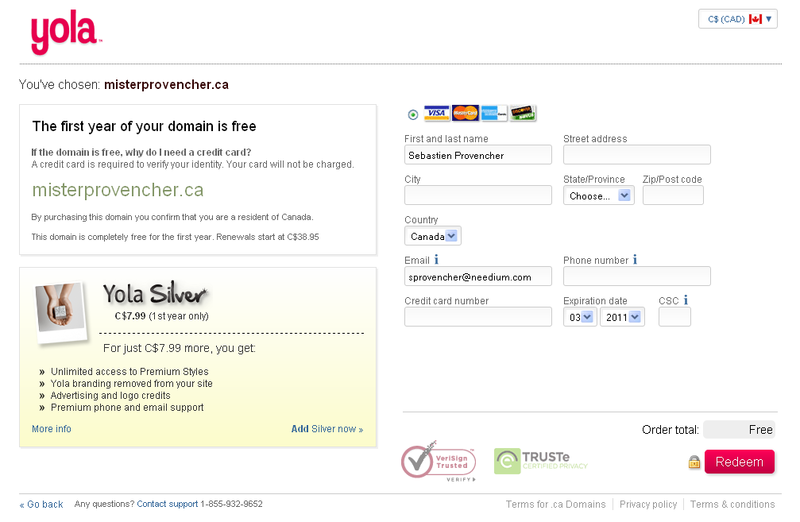 After creating an account, you get to a page that offers you to register your free .ca domain name. I went through the various steps to find an available domain name and you eventually get to a registration screen that asks you for credit card information “required to verify your identity”. That makes sense. I was really surprised to read the following fine print on the page though: “This domain is completely free for the first year. Renewals start at C$38.95”. So, it looks like your “free” domain name is really just free the first year and it’s not transferable. Doesn’t sound like a good deal anymore, does it? This really disappointed me. I thought Google had made a move to really change the Canadian SMB landscape by offering a permanently free intro website and domain name. After all, they’ve made other game changing moves in the past and I was expecting the same. But not this time. So, caveat emptor. Google launched a similar campaign in Belgium where they partnered with Belgacom (telecom operator) and Bpost (postal service). The quality of the “free website” is very low and actually requires some time/technical knowledge. The domain registration after the first year was ridiculously expensive. Great article. Caveat emptor indeed! Perhaps better for SMBs/Individual Professionals to go to http://www.webnames.ca and purchase a .tel global top level domain for C$19.99 which includes genuinely FREE Telhosting, stores all contact details including social media and provides a very smart PC/mobile presence, plus upsell pressure to buy Adwords/Google Tags. Good post Sebastien. I talked to the people at Yola, and they have confirmed that the .ca domains can in fact be transferred … according to their Social Media Coordinator & Community Support person Laura. I also got some other questions answered about what happens after the first year, and included them in a post here http://www.searchenginepeople.com/blog/google-offers-free-websites-to-canadian-smes-quick-evalutation.html. Thanks for your comments Jeff and jvrudnick. I just wanted to confirm that the person or business who registers the domain via the GYBO program is the owner of the domain and as such can do with it what they wish after the initial 60 day waiting period mentioned previously, including transfer it to another registrar. It is our belief that domain owners will be so thrilled with the website building tools, hosting and support we provide, they will recognize the value of keeping their domain registered with us even if it costs a bit more. We consider ourselves an all in one solution for small business owners and believe that our overall product offering warrants our higher domain price. 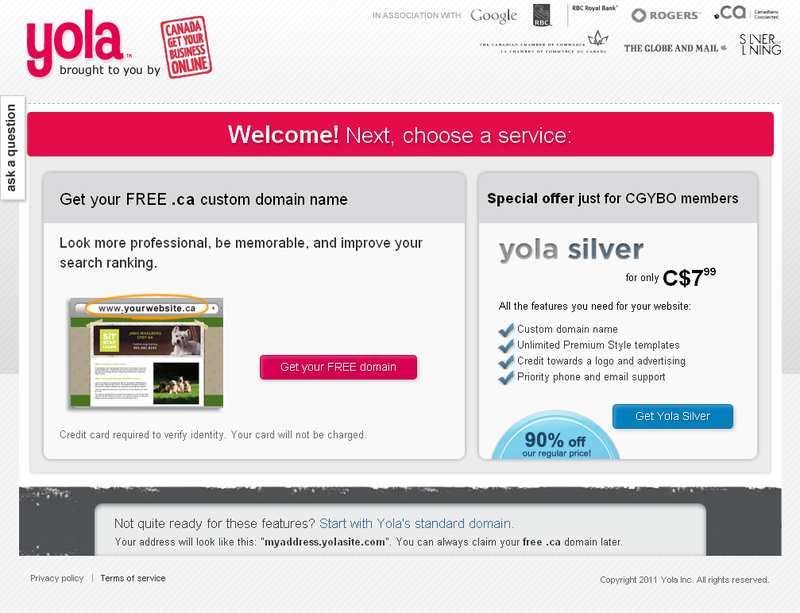 Again, if you feel differently, you are under no obligation to keep your domain with Yola. I also feel it should be mentioned that the program Jonas Eraly mentioned Google launched in Belgium in his comment is with a partner not connected to Yola. As such, we can’t make any comment about the quality of sites users were able to create through that program but again, we feel confident the experience with Yola will be a positive one if you utilize the tools we have, designed to set your business up for success on the web! 1. How many CANADIAN web designers are Yola and Logoworks by HP hiring to produce these Canadian websites that Google has seen fit to hand over to American companies? 2. How many CANADIAN customer service/technical support personnel are Yola and Logoworks by HP hiring to support all this new business from Canada? 3. How much in commissions are you sharing with Canadian members of your Affiliate program, for all the new Canadian customers they are referring to you through GYBO.ca? Why are you stealing 100,000 potential web design projects from Canadian web designers, and handing it to American companies? Why are you collaborating in this theft of jobs from Canada? Why didn’t you insist that Google had the work done in Canada, before you signed on? HEY HEY YEAH Canadian_Web_Designer…you are RIGHT on the money! I notice that there is not a single further post to this blog after your last comments. Hmmmm….I wonder if you have scared everyone off? But I too want to hear the answers to your most accurate observations. I this all a gag or is it for real? Something just doesn’t smell quite right to me. If anyone out there has actually submitted everything and is online through this program, I invite you to share your experience with us. Also, I challenge Laura Thomas from Yola.com to reply to Canadian_Web_Designer post above and address these very important questions. I will be watching for the replies…. I felt I had shared Yola’s position and intent thoroughly enough in my original comment and didn’t feel that there was anything further to be gained by engaging further in this conversation. We respect your opinion and it’s not my aim to change your mind. That being said, I feel I must reiterate, while we do have a Canadian support person working on our team, our purpose at this time is to provide a service for Canadian small businesses, not to create jobs for Canadians. We are a small startup with less than 100 employees. We hope that our service will be of value, even though we are not, nor did we ever claim to be a Canadian company. HP Logoworks is a third party service that we have partnered with to help design sites for those who do not wish to build them themselves. However, this is entirely optional and Yola’s primary contribution is to allow small business owners to get online for free. This sounds great to me, I really don’t care who designs my web-page, as long as its done well. I’m just glad an American company is willing to help small Canadian business’s. American companies don’t seem to be as greedy as Canadian companies, who want an arm and a leg for doing anything. actually, if you read all of the site before you started entering data (which I did the past 48 hours), you would have seen that your domain name IS transferrable, but that you agree to keep it with the program for 3 months. I will say there are small bugs and kinks being worked out of the sign-up process, and yes, it’s not the easiest program to wade through and yes, the renewal fee is high, however, the program DID give me exactly what it promised, and in 1 year from now, I’ll be so grateful to have had a FREE opportunity to get my business off the ground I’ll be happy to pay double what they ask for renewal of my domain http://www.ancientwonders.ca Also, I was given the Silver upgrade with telephone support for $7.99 CDN, which included a free logo from Hewlett Packard’s LogoMaker ($49 freebie, seriously), and a business promotion package that covers advertising through Google Adwords for free. Really, I’ve been banging my head against the wall for 3 months trying to figure out how I was going to be able to afford all this web presence stuff, and this program – for me – was perfect. Thank you Google! !